Can You Teach an Adult Brain New Tricks? For many years, we thought that once you were an adult, your brain was mature and did not change for the rest of your life. Recent research has shown that the neurons of your cortex and your hippocampus are constantly changing, responding and adapting to your environment and to what you’re thinking and doing. Research with victims of brain injury has shown that with precise focus, determination, and constant repetition, one part of the brain can take over function from an injured part of the brain. One of the discoveries of such imagining technology is that learning and physical exercising can stimulate new neurons and grow more dendrites on current neurons. We can literally plump up our brains and slow the aging process. This amazing phenomenon is known as brain plasticity, which simply means that where the brain is concerned, it’s never done growing and changing. See Dr. Stuss’s wonderful talk. Don’t be put off when you see it’s 51 minutes long. Just invest in first five minutes. Did you know drumming can reprogram the brain after a stroke? Even if you watch it just 5 minutes at a time, as I did, you will learn a lot. Once we are adults, most of our neurons stay with us for life. We do grow new neurons, mostly in our hippocampus and, although about 50% of them do not make it to fully developed neurons, we can improve the chances of neurons maturing by continuing to learn new information and new activities. With specific, repetitive, and persistent work, some parts of the brain can take over function from other parts of the brain that have been damaged. Some underdeveloped functions like accurately hearing and producing speech can be improved with specific, repetitive, and persistent work. 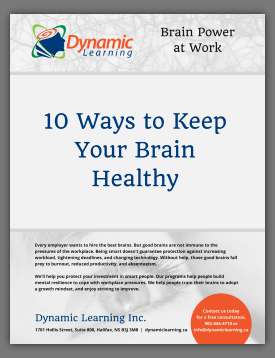 We can continue to stimulate our brains with learning, exercise, good nutrition, and enough relaxation and sleep to enhance the power of our brain and slow the aging process.